I was immediately sceptical when I first read the press release for Job Hunters. How often does a person see the words “dystopian roommate comedy” within the same sentence? By its very nature, the dystopia is not something that lends itself to comedy. Nonetheless, I watched the first episode on the day the series premiered on youtube. After eight minutes and forty-five seconds, Job Hunters had demonstrated two things: a brilliant taste for black humour and bang for the buck production values that put traditional television to shame. For the record, I gave Job Hunters another four episodes before putting pen to paper on this review. The premise of the series capitalizes on popular culture’s current fixation on young adult death matches while keeping a healthy distance from other established properties. The setup is straight forward: as a means of population control and social engineering, college graduates report for mandatory arena combat. Within the arena, the grads spend the work day battling each other to the death as a means of showing off their talent to potential recruiters. Their off hours are spent in a safe house where the majority of the series finds its focus. 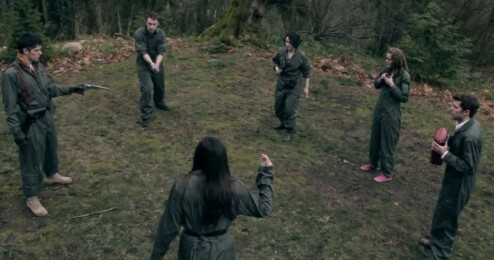 Therein newcomers Devon (Forest Gibson), Avery (Kristina Horner), and Paige (Meagan Naser) form a co-existence pact with arena veterans Max (Joe Homes) and Tiffany (Tara Theoharis). But with an 80% mortality rate, the arena is a dangerous place to make friends. First question: if this is what happens to college grads, what’s life like for the people who don’t get into a university? 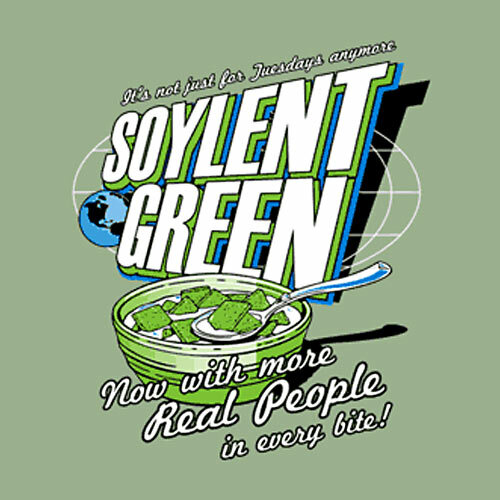 Do high school drop outs become Soylent Green? Initially, I thought that the series might be trying too hard to be all things to all people. Upon further consideration, I’m content to chalk this feeling up to a side effect of pairing something as mainstream as comedy with a sub-genre as specific as near-future dystopia. What emerges, despite the “roommate comedy” branding is a comedic sensibility that is often very dry and very black. Think along the lines of Episodes with a dash of Community’s paint ball oeuvre thrown into the mix. The comedy can often be subtle, but so are the dystopian elements. There’s also a soft spoken, but decidedly intense, dedication to professionalism within the production of Job Hunters. The post production effects are subtle but add a Mass Effect inspired aesthetic to the gadgets of this near future. The interior of the safe house, as well as the location shots for the arena, are stunning. In addition to the primary cast, there is a venerable army of extras adding to the “this isn’t your average web series” vibe that permeates the production. The music which accompanies key scenes could be mistaken for the work of Bear McCreary or Clint Mansell. And did I mention that each episode is nearly ten minutes long? With the first season funded entirely via kickstarter, and probably no shortage of sweat equity, I can only imagine what wonders the producers would be capable of with a grander budget. Granted, there is the odd bit of acting ends up chewing the scenery rather than conveying an expected emotion. The character of Doctor Monroe stands out in my mind on that point; the actor in question could have made an at-his-prime Paul Darrow blush. Yet these minor imperfections never amount to much. Instead, the story has kept my focus on the complicated relationship between a group of characters who, in all but one case, refuse to acknowledge that they are going to likely end up killing each other…for a job offer. And that sense of polite yet high stakes competition speaks to where I think is Job Hunters is going to find its core audience. Consider the series as a metaphor for anybody who graduated university within the last ten years only to find the job market saying “Nah, we’re going to go with somebody older/more experienced/better connected.” Friends quickly turn into rivals when competing for work in a shifting economy. Cognitive dissonance is often the only thing that keeps those relationships from devolving into outright hostility. If I set aside everything else that makes this web series work, the fact that it is using humour rather than a soap box to channel a generation’s anxiety about finding meaningful employment is enough make me sign up for the rest of the season and any others that follow. Bravo to the entire Job Hunters team. I know I’ll be contributing to the kickstarter for season 2 when it comes around. 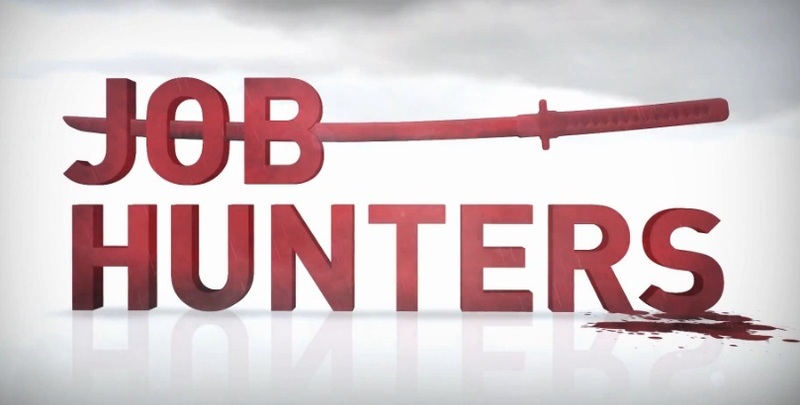 You can watch the first episode of the series below and head over to http://watchjobhunters.com/ for updates on the show and behind the scenes video. The series is funny and engaging. The special effects are truly amazing, considering the shoe string budget. I was on kickstarter and searching for projects from the NW when I found Job Hunters. Once I started watching these episodes, I was amazed at the high quality production, the subtle but amazing special effects and the writing…while keeping it entertaining with humor, they also developed the characters very well which has to be tough in a few 10 minute episodes. I doubt very few productions of this value are created with such short funding. Yeah, it really is quite something, isn’t it. I can’t imagine just how much sweat equity went into this show to balance out the low budget but high production values.